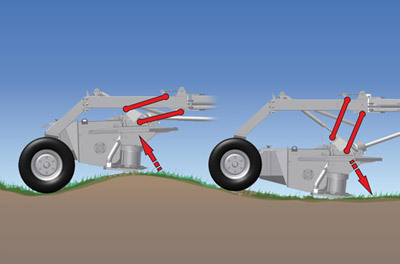 Pull type mower coupled to the tractor through the rear tractor hitch. 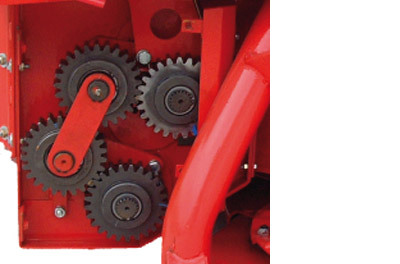 The rotary gearbox allows a large angle in case of maneuver without shutting down the tractor’s power take-off. 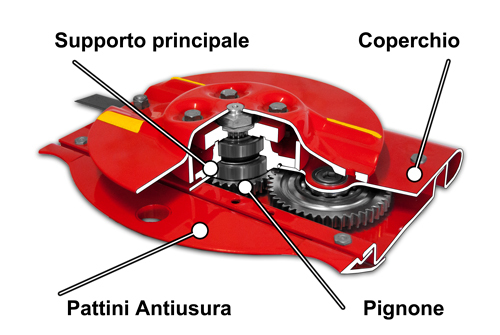 The primary transmission takes place by an oil bath multiplier, 540 or 1000 revolutions by rotating the box, while the secondary transmission is through gears in oil-bath . Adjustement of the cutting height is done by a lever on the chassis of the mower, which varies the inclination of the mowing unit. 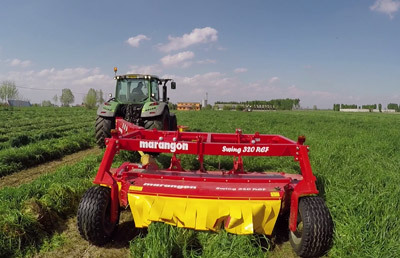 A simple effect cylinder allows maneuvering the mower to reach the most difficult points in the field. The SWING model is equipped with a self-leveling suspension that allows the mower to follow the course of the ground with extremely precision and to smoothly overcome dents and falls, reducing the risk of damage to the mowing unit. The double spring suspension allows an optimum calibration of the mower’s weight to maintain uniform the soil pressure, ensuring a clean cut and no damage to the grassy cot. 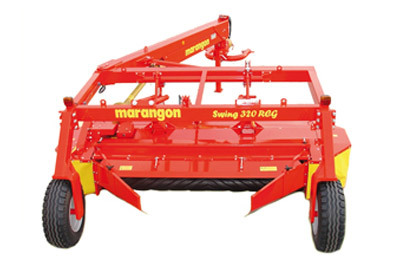 Mower available in version with rubber roller conditioner, nylon finger, iron finger for a considerable time saving and lower risk of exposure to climate hazards of the crop. 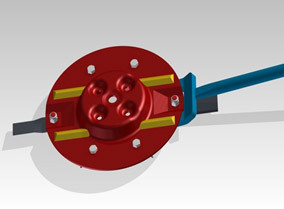 The cutter bar,has a very compact design and a C-profile reinforcement embedded in the cover which provides total stiffness and perfect penetration in all types of crops. 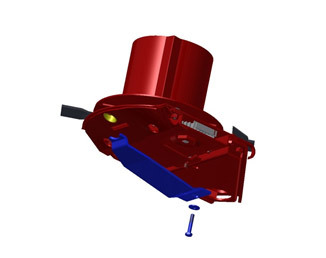 The the main support consists in a single block secured with six screws and allows a quick, individual and simple examination of the gearbox without opening the cover. 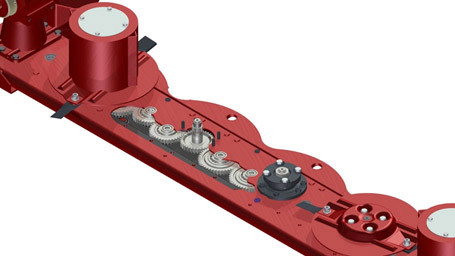 The bearings are mounted with great pitch clearance to cancel the transverse forces of the pinion shaft. The heavy duty cover, with integrated C reinforcement, avoids the bending of the cutting unit in order to avoid the twisting of moving parts. 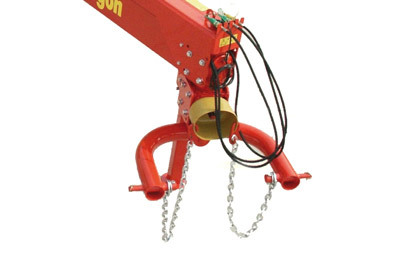 Anti-wear skids at the bottom of the cutter bar are made of a special anti-wearing steel and have a wedge-shaped angular profile for penetration into high-density crops and avoid frontal clogs. 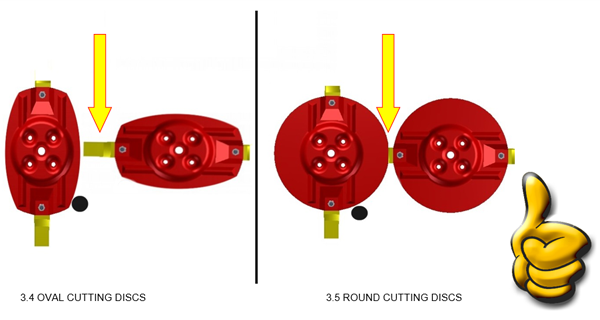 The application of additional shoes offer a higher protection of the bottom of the cutter bar when working in particularly abrasive soils. The main frame allows to the mower to follow the course of the ground with extreme precision and to overcome without difficulty bumps. An excellent fit to the ground and easy overcoming of improper obstacles reduces the risk of damage to the mowing unit. 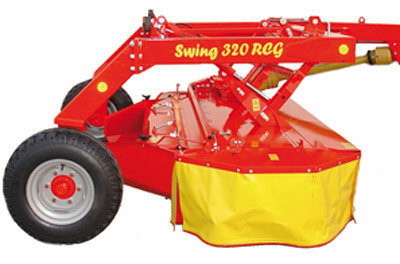 Swing mowers have a self-leveling suspension, made by springs which allows a perfect calibration of the weight of the mower on the ground in way to maintain a uniform ground pressure, always ensuring a clean cut and no damage to the grassy cot. 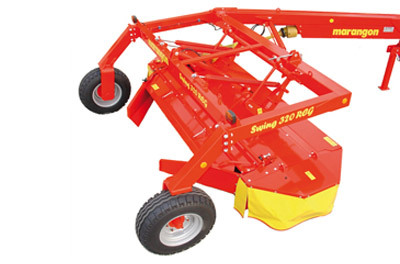 Swing mowers have a pivoting attachment that allows the mower to maneuver easily without disconnecting the tractor’s power take-off. 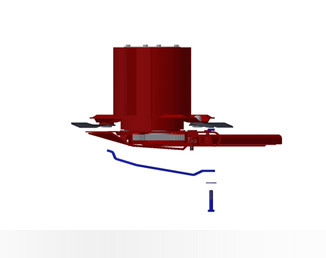 It is possible to change from 540 to 1000 rotation speeds by rotating the gear box unite. 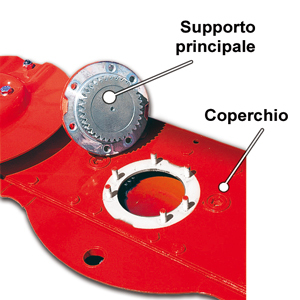 The intensity of the conditioning is quickly adjustable by the opening of the rollers which are mounted on springs that allow automatic opening even when encountering a foreign body. 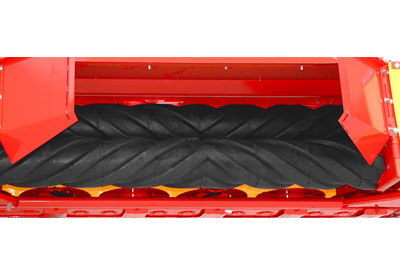 The transmission of the two rollers always guarantees syncronis. The conditioner unit is equipped with a nylon finger rotor that provides great resistance to bending and impacts. The V shape and helix arrangement of the teeth ensure smooth and effective conditioning over the entire length of the cut. The conditioner is driven by four trapezoidal belts, adjustable with an automatic belt tensioner. The intensity of the conditioning can be adjusted quickly through a multi-position lever that allows the approach of a striped sheet. Conditioning is effective and regular, and the stem is punctured throughout its length. 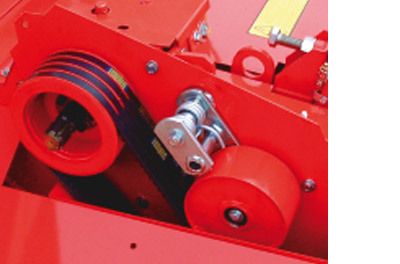 Nylon teeth are perfectly suited for large-width mowers, ensuring lightness and ease of handling. 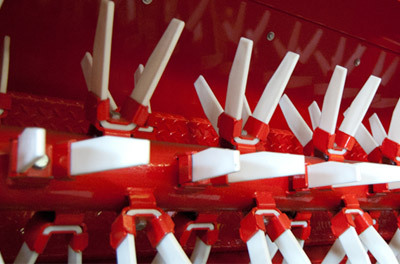 The conditioner unit is equipped with a mobile iron finger rotor that provides great resistance to bending and impacts. The V shape and helix arrangement of the teeth ensure smooth and effective conditioning over the entire length of the cut. The conditioner is driven by four trapezoidal belts, adjustable with an automatic belt tensioner. The intensity of the conditioning can be adjusted quickly through a multi-position lever that allows the approach of a striped sheet. 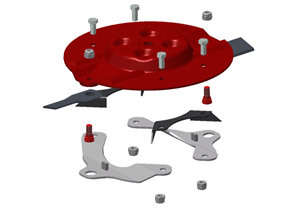 The anti-wear kit can be mounted on request directly on the mower or can be installed easily and quickly by the user even after purchasing a MARANGON mower. 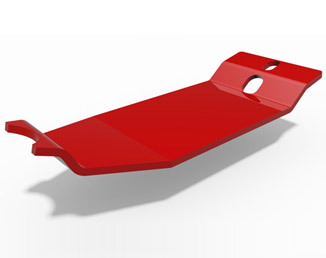 Stamped, made of wear-resistant and hardened material, provide additional protection to the cutting unit.